Flash isn't only about mathematics and complicated action scripts, it's also about vectors. One of Flash's most under-utilized options is its ability to create realistic vectors from scratch. For all you hopeful vector artists out there who don't have the pocket change to purchase another software application, or for those who just want to try vectoring the Flash way, this is the tutorial for you. Grab a cup of coffee and let's get started! Setting Up Your Work Space. All artists know that setting up your work space is crucial to creating a happy working environment. As Flash makes it so easy to vector, we'll only need a few tools for this project. Here are all the tools that you'll use. Become very familiar with their shortcut keys so that you save yourself wasted time and unnecessary clicks. In this tutorial, we'll discuss the method of tracing over an image to create a realistic vector. When duplicating this method, be sure to choose an image with a relatively large resolution. It's more difficult to see the details on smaller images. I selected this image from dreamstime.com. Import your selected image onto the stage (Ctrl + R). Under the properties panel, change the size of the stage to match the image's size, then center the image on the stage (Ctrl + K). Lock that layer and rename it "reference". Save the file and be sure to save periodically. Create a new layer and select the Line Tool (N). Change the color from black to another color that contrasts against your image. Using your mouse, draw a line to trace a small portion from point a to point b on the image. The line should be relatively small and the area between the two points should contain one curve. Next, select the Arrow Tool (V) and hover over the line you just drew until the arrow cursor shows a small curve icon attached to it. This icon indicates that you can curve the straight line. Do that by dragging the line in the direction you'd like to curve it, while holding down the mouse button. You're not limited to dragging the line only in the middle, you can also drag the line to the left or right. You may also notice other icons appear as you create more lines and seek to manipulate them. Continue to trace the remainder of the body, making sure that each line is small and composed of only one curve. This ensures that your lines will look more realistic when finished. If you need to erase a selection, use the Arrow Tool to drag a marquee around the selection and press delete on your keyboard. Name this layer "outline". Lock this layer and continue locking all others as you complete them. Create a new layer for the face and name it "face outline". Make sure the line weight is 1 pixel and begin tracing the eyes, nose, nostrils and lips. Zoom into the image to capture the necessary details. Create a new layer for the iris and teeth. Select the Circle Tool (O) and click on the "no color" icon in the Color Mixer box. Draw a circle over the image's iris. Copy the iris (Ctrl + C) and then paste (Ctrl + V). Move the copied iris over to the second iris. In the Color Mixer box, change the type to Radial. Select the inner color to be black #000000 and the outer color to be brown #412420. You can also choose the eyedropper tool to select a more authentic color. Hover the Paint Bucket (K) over the middle of the circle and click to fill. Make sure that the inner black color mimics the appearance of an pupil, or slide the gradient displays until it suits your tastes. Next, go to and unlock the "face outline" layer and select the eye outlines with your arrow tool. You may need to press the Ctrl key to select all of the individual lines that make up the eye outline. Copy it, delete it and then lock that layer. Return to the iris and teeth layer, right-click on the stage and select "paste in place". Delete all the parts of the iris that fall outside of the eye outline you just pasted in. Name this layer "eye color". Create a new layer for the iris. Hide the "eye color" layer. Draw a circle and fill with a radial gradient with three shades of black and one gray color for the highlight. Use the eyedropper to get the exact color from the reference image. Hide the iris and eye color layers. Return to the "face outline" layer and fill in the pinkish white color in the eyes. Sample 3 colors from the eyes from the inner, middle and outer areas. Use the linear gradient in the Color Mixer. Here are three samples of colors found in the image #D5D0CD, #D3C7C7, #B5A09B. Check the realism of your work by unhiding the "eye color" and "iris" layers. Create a new layer to add depth to the iris. Return to "eye color" and copy the iris outline (not the color, the outline only). Then paste the outline in place on layer 6. Take the Brush Tool (B) and begin to draw a series of fragmented shapes around the iris. Be sure that the shapes are connected. Fill this first layer with a color similar to #060202. Name this layer "iris detail 1". Create two additional layers, do the same, but draw a different set of fragmented shapes then name these layers "iris detail 2" and "iris detail 3". Use colors #361C16 and #452518 respectively. Move all three layers under the pupil layer. Create a new layer and name it "iris highlights". Use color #COC2C7 at 45% opacity and the Brush Tool to draw specks of highlights in the iris. Return to "face outline" and fill in the pink inner eye with #73372F and #8C5C4E. Fill in the eye waterline with the colors #896E67, #705C5D and #573E37. Create a new layer for the eyelashes and outline them with the Line Tool and fill with Black. View your progress by hiding the original image. Create an eyelashes detail layer. Click on the outline icon in the Layers Box to show the outline of the eyelashes. Take the Brush Tool and create eyelashes with one smooth stroke each. Take the Eraser Tool (E) to tidy up the eyelashes. Create a new eyelashes layer underneath the other eyelashes layers. Copy and paste the "eyelashes detail layer" into this layer. Change the brush opacity in the Color Mixer to 75%. Name this layer "lashes shadow". Move all layers pertaining to eyes into its own folder, named "eyes". Create a brow layer. Use the Line Tool in black at 75% opacity to trace and then fill in with the color #563B30. Create a new layer and then use the Brush Tool (B) in Black at 25% opacity to draw the individual hairs in the eyebrow. Move all layers which refer to the eye into their own folder, named "eyes". Return to "face outline" and select the outline of the lips. Copy it and then lock the layer. Create a new layer and then paste the lips in place. Referring to the base image, select the most common color in the lips, which in this case is #BE482E. Use the Paint Bucket (B) to fill in the lips with this color. Name this "lips base". Create another layer. Change the color to #792820 and select the Brush Tool (B) to draw the creases in the lips. Create another layer for the lips highlights. Use #DAB9B2 at 30% opacity and draw tiny dots of shimmer in the most natural places where the light would hit the lips. Create another layer for the lips shadows. Change the color to #8F3E29 at 50% opacity. Draw a soft shadow around the lips in places where the light would not naturally fall. Use the base image as a guide, but feel free to follow your own intuition. Create yet another layer for the lips shadow. Change color to #3516OF, still at 50% opacity. Use this to make the corners of the lips darker and give the overall mouth more dimension. Return to "lips base" and change the color of the line to #49323A. 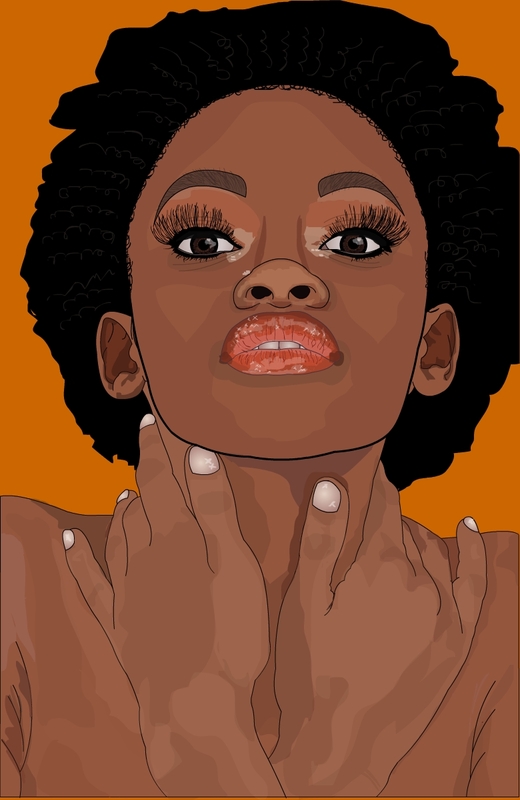 Create a new layer, named "highlights 2" and select the Brush Tool (B) tool with the color #DA8383 at 45% opacity to create subtle highlights over the lips. Alternate to #F3D8D8 and #F3D825, both at 45% opacity. Create a new layer and paste in place the lip outline again. Next, draw teeth with the Line Brush (N). Select the Fill Bucket and select Radial Gradient. Choose the colors #D5C6C1, #934C47 and #A67973. Move all of these lip layers into their own folder. Return to the eyes folder. Go to the "eyelashes" layer and copy. Create a new layer named "eyelash shadow" and paste the eyelashes in place. Select all of the lashes and then change the color to #090909 at 90% opacity. Move the lashes over to the right and down with the keyboard arrow to create a realistic shadow. Create a new layer named "makeup" and use the Brush Tool (B) with the color to #C16649 at 40% opacity. Draw the outer corner of the eyeshadow. Change the color to #E6CAB5 and brush the inner part of the eye. Return to the outline and fill in with the color #94563D to create skin. Fill in the nails with a radial gradient using the colors #E4D1C3 and #A67973 for the colors. Return to the "face outline" layer and change the nose outline color to black. Fill in the nostrils with the color #100708. Create a layer named "nose highlights" and fill with color #DAA583 at 20% opacity. Create a new layer for the highlights on the ridge of the nose and the forehead. Use the Line Tool (L) to draw the highlights' shapes and then fill in with #DFBY97 and #D39770 at 20% opacity. Create another layer for the face shading. Return to "face outline" and copy the outline of the face. Go back to the new layer and paste the face outline in place. Use the Brush Tool (B) in #814938 at 50% to draw a shadow along the outer circumference of the face. Create another layer for the nose shadow. Use the same color and opacity value for nose shading. Move to the nose folder. Create a lip shadow and eye shadow using #7A4B38 at 60% opacity. Create another layer to tweak the eye makeup highlights. Use the color #E0B199 then move layer to the face folder. Draw hair outline with the Brush Tool (B) in black. Create curly lines with the Brush Tool (B) in #1C1817. Create a new layer named "hand highlights" and use #C08D70 at 10% opacity. In another layer named "hand shadows", use #502618 at 10% opacity. Create a new layer for the chest's shadow. This step relies heavily on the reference image. Zoom into the image with the Zoom Tool (Z) and use the color picker to select the proper color. Change the opacity to 15% and then draw shadows which mimic the natural shade in the reference image. Fill in the color and repeat. Create a new layer for sparkle in the eyes, on the lips and for the nose ring. Use the color #FOE5E1 at 54% opacity with the Brush Tool (B). Move this layer to the eyes folder, above the makeup folder. Draw the smile lines around the eyes in black at 25% opacity. Delete the reference image, then resize the image by unlocking all of the layers, pressing Ctrl + A on your keyboard, then going to Modify > Transform > Scale. Change size to 780 x 1201.8px. Resize the document properties by going to the Properties box and changing the size to match the image's new dimensions. Change the background color to something contrasting but complimentary, like #CC6600 and save. To save as a .jpg, go to File > Export >Export Image. That's it! Don't forget, you can apply this process to any image you like. I hope you enjoyed following along! Jacqueline is an artist and a writer who spends an inordinate amount of time playing Super Nintendo and watching Star Trek. In her art, Jacqueline enjoys the challenge of creating beauty through the unlikely medium of Flash. You can find out more about Jacqueline on her website, and follow her updates on Twitter.